Carlisle manager Keith Curle says striker Derek Asamoah is still short of full-match fitness despite scoring four goals in five games. The 33-year-old has been a revelation for the Cumbrians since signing a short-term contract in October, which has since been extended until January. 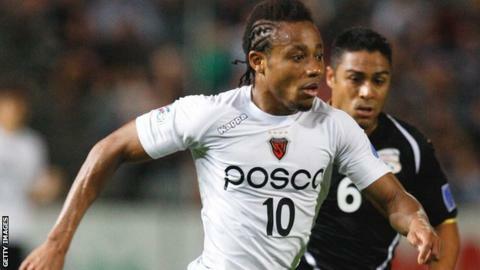 He had been playing for Daegu in South Korea before his return to England. "He's working hard and he has a good understanding, he's a threat," Curle told BBC Radio Cumbria. "Derek's nowhere near fit yet, but he's got others around him creating space, and also we gave him good information about what is needed from him." Asamoah's latest match-winner came in Saturday's victory against Accrington Stanley at Brunton Park, a victory that lifted Carlisle six points above the relegation places. It was also the first time in 13 games their opponents had been held goalless, a fact that delighted former centre-half Curle. "It's pleasing, the back four can take confidence from that," Curle added. "We nullified them, I can't remember (goalkeeper) Dan Hanford being stretched. "They were a threat that needed to be dealt with, the back four stood up as a unit and give us a platform to go to play."